This box will turn you into a goat cheese maker. Photo courtesy Belle Chevre. Ever wanted to make your own cheese? Are you a lover of goat’s milk cheese—or do you know one? 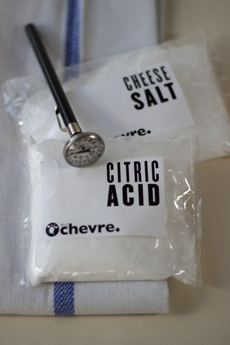 Then here’s the perfect item: Belle Chevre’s Do It Yourself Goat Cheese Kit. It’s so easy (and fun) to make goat cheese at home. Belle Chevre is one of our favorite makers of goat cheese: a Top Pick Of The Week twice for their wonderful flavored goat cheese spreads and heavenly goat cheese cheesecake. The award-winning cheesemakers have put together a cheesemaking kit with everything you need to make goat cheese in your kitchen in just a few hours, and with only about 10 minutes of active kitchen time. You need only supply the goat milk, available in most supermarkets and all natural food stores. The same day your kit arrives, you can be rolling your own chevre logs or mixing a bowl of fromage blanc, a fresh cream cheese that’s much lower in fat and calories (and one of our favorite foods). And of course, there are hundreds and hundreds of recipes, from appetizers to desserts, like goat cheese cheesecake and ice cream. 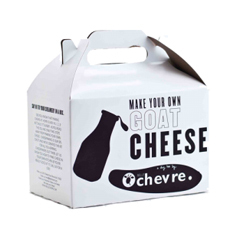 Get your goat cheese kit from BelleChevre.com. The kit is $27.95, but after you get the hang of it, you’ll be able to buy the ingredients for very little and make goat cheese for less than it costs to buy it. What’s inside the box. Pick up goat’s milk at the supermarket. Photo by Elvira Kalviste | THE NIBBLE.